It’s fascinating to see how modern technology has helped us increase our agricultural productivity in areas not otherwise suited for our higher value crops. 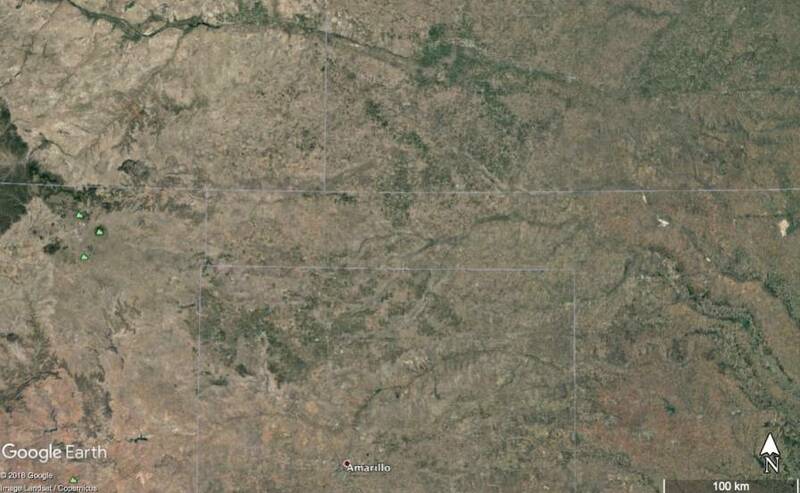 When viewing the Texas and Oklahoma Panhandles and southwest Kansas in Google Earth (see below), you can see areas of green interspersed with predominantly brown tones. 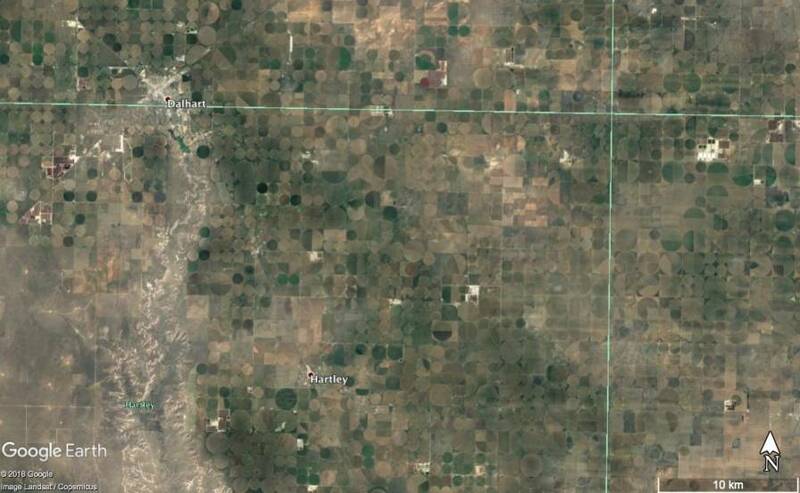 Zooming into any of these areas, you quickly discover that the vast majority of these green pixels are irrigated fields, drawing water up out of the ground from the Ogallala Aquifer, moistening the soil and the lower atmosphere via evapotranspiration that would not otherwise be occurring. Most of us have experienced micrometeorological effects due to small scale variations of the landscape, but with the much larger areas of landscape modification, visible enough to be readily identified from space, I am reminded of research by scientists such as Dr. Roger Pielke, Sr., postulating that landscape changes may be affecting climate regionally, perhaps much more significantly than any effect that atmospheric carbon dioxide content has had on a global scale. Even as I was preparing this article, a press release came out discussing how a team of MIT scientists show evidence that Midwest summers have been cooler and wetter due to increased corn and soybean production. Just to get this on the record right away, I am not saying any of this is bad, good, or neutral. Our planet is an amazingly complex system of systems that are remarkably designed to interact and feedback with each other in more ways than we will ever understand in our lifetimes. We should apply what we have learned to feed a growing world more effectively while stewarding our most valuable resources such as water. As one of Dr. Pielke’s graduate students in the early 1990s, I used numerical simulations of the atmosphere to determine whether or not variability of soil moisture and vegetation cover play a role in formation and evolution of Great Plains drylines, a type of weather front that frequently forms in the spring and summer days across this region, serving as a focal point for the formation of storms that provide a substantial portion of warm season rainfall as well as severe thunderstorms and tornadoes. Indeed, our simulations suggested that areas having high contrast in soil moisture conditions can enhance dryline strength and resulting local-scale circulations needed to initiate storms. My real interest in this area lies in whether or not we can improve our numerical weather prediction models, and thus our short and mid-term weather forecasts, through more accurate input information and improved physics algorithms. These models all use coupled Land Surface Models (LSMs) that account for heat and moisture transfer between the air, vegetation, and ground. 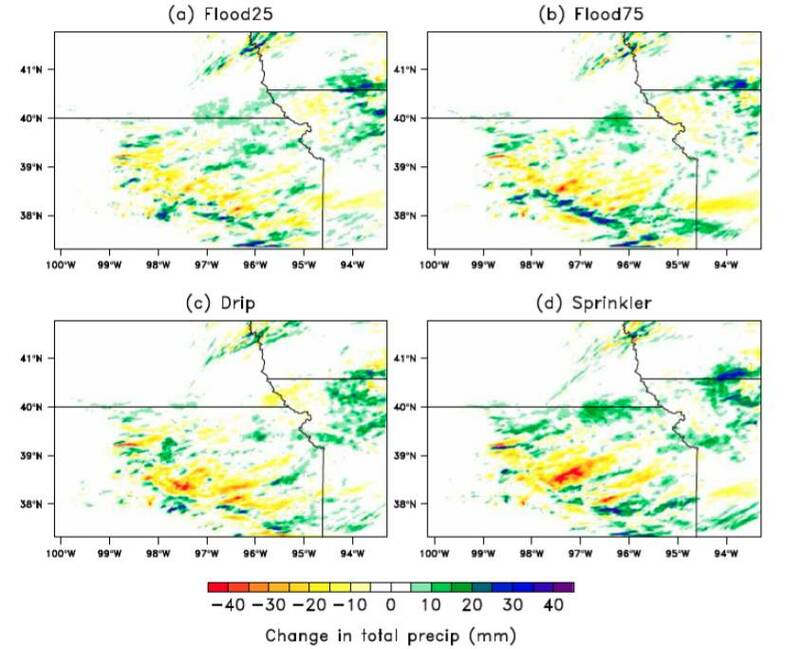 In 2015, a team of researchers led by Dr. Patricia Lawston published a paper in the American Meteorological Society’s Journal of Hydrometeorology that documented their study on the impacts of different irrigation methods on high-resolution numerical simulations of the atmosphere in Kansas and Nebraska. Using the USGS land cover database to identify all the areas of irrigated cropland, they ran simulations over two different growing seasons: 2006, which was a generally dry year; and 2008, which was a wet year. For each of those seasons they ran four different simulations, with the differences being the assumed type of irrigation method used on all the irrigated cropland. The methods compared were sprinkler, drip, and two cases of flood irrigation (using different thresholds to trigger a need for irrigation). Even though about 80% of the irrigated land contained within the region of their simulations use the sprinkler method (primarily center-pivot systems), the point of the study was to get a sense of how important it might be for the LSMs to properly handle the physics of the various methods. That is, the more sensitive the models are to these differences, the more important it is to accurately include such information in the operational models. The overall sensitivity was determined by comparing each set to a “control” simulation where no irrigation activity was included anywhere in the region. In all cases, the inclusion of simulated irrigation activity in the initialization of the LSM coupled with the weather model supported previous observational and numerical studies that irrigated croplands increase the humidity, decrease daytime maximum temperatures, and increase overnight minimum temperatures. Their paper included specific examples where daytime maximum temperatures were reduced by nearly 9°F in these areas compared to a simulation that did not consider the irrigation activities, and there was noticeable variation between the different types of irrigation techniques. Figure from Lawston et al. (2015) paper showing differences in simulated two-day rainfall accumulation over 25-26 May 2008 between simulations using four different types of irrigation on the irrigated croplands compared to a simulation that neglects irrigation. Click to enlarge image. What I find even more interesting from a forecasting perspective, especially when it comes to the need for accurate forecasts in irrigation management, is to look at how rainfall forecasts might be affected by including proper irrigation activity and physics in our models. I have included a graphic from their paper showing differences in two-day simulated precipitation accumulation between each of the cases that included irrigation information and the control run. There is significant signal in all of these cases, with both positive and negative changes exceeding 1” of accumulation. Also of note is that the larger impacts are not over the irrigated areas, but the adjacent and downstream of these areas. However, I speculate this may in part be due to the fact that much of the irrigated land is in the climatological drier area (hence why there is more irrigation there). But, it certainly corroborates my old study and many other subsequent studies that the distribution of soil moisture (location of wet vs. dry and the intensity of the differences) and vegetation cover has an impact on the development of the small-scale focal points for storm formation, along with an effect of providing additional moisture content to the storms themselves. We need to move beyond “one-way” data information exchange, where one part of our national infrastructure consumes data from another without reciprocation. In this case, instead of agriculture being purely a consumer of weather information, it should also be a contributor of data that can improve services for all. And it has to be much more than additional weather stations. If we actually had soil samples, planting dates, irrigation type and activities, we could feed such information directly into the land surface models to improve local scale weather forecasts directly. I recognize there are tremendous cultural, legal, and technical issues involved. But, I am hopeful we can realize this goal over time as the world’s different technologies continue to become more interconnected and groups like AgGateway continue to build data exchange standards. We need to recognize the hydrological cycle is also a local and regional issue, not just one associated with global climate patterns. Technologies such as Variable Rate Irrigation, combined with advanced weather, soil and agronomic analytics will become more cost-effective and will be enabling factors to help us become more weather-resilient. As a nation, we need to ensure we remain at the cutting edge of near-term weather analysis and forecasting science and technology to support these initiatives. We have a lot of work to do and many challenges, from basic science through implementation to the legal challenges, but our need to feed a growing world will get us there as we work together. 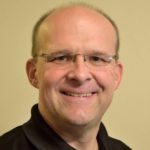 Brent Shaw is a Certified Consulting Meteorologist and VP of Weather Content and Customer Success at Iteris. In this role, Brent oversees data acquisition, creation, and quality control in support of transportation weather and global precision agriculture software-based services. He has been involved in applied meteorological research and development for over 20 years, spanning military, civilian, and commercial sectors. A native of Kansas City, he is now based in Norman, OK. See all author stories here. Thoroughly enjoyed reading this. I did my own research in soil moisture and vegetation anomalies and impacts to convection. I shifted into agriculture and hydroclimatology in my career over the years and have come to the same conclusions and feelings.